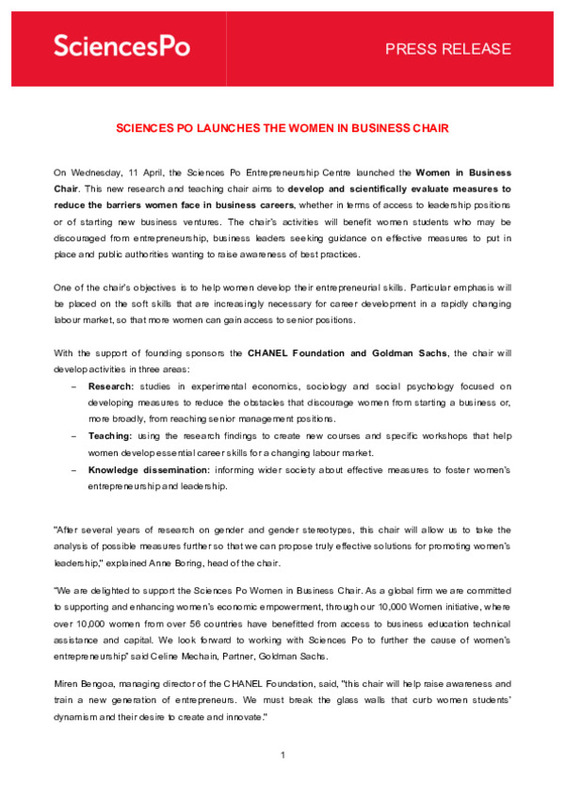 On Wednesday, 11 April, the Sciences Po Entrepreneurship Centre launched the Women in Business Chair. This new research and teaching chair aims to develop and scientifically evaluate measures to reduce the barriers women face in business careers, whether in terms of access to leadership positions or of starting new business ventures. The chair’s activities will benefit women students who may be discouraged from entrepreneurship, business leaders seeking guidance on effective measures to put in place and public authorities wanting to raise awareness of best practices. One of the chair’s objectives is to help women develop their entrepreneurial skills. Particular emphasis will be placed on the soft skills that are increasingly necessary for career development in a rapidly changing labour market, so that more women can gain access to senior positions. - Research: studies in experimental economics, sociology and social psychology focused on developing measures to reduce the obstacles that discourage women from starting a business or, more broadly, from reaching senior management positions. - Teaching: using the research findings to create new courses and specific workshops that help women develop essential career skills for a changing labour market. - Knowledge dissemination: informing wider society about effective measures to foster women’s entrepreneurship and leadership. "After several years of research on gender and gender stereotypes, this chair will allow us to take the analysis of possible measures further so that we can propose truly effective solutions for promoting women’s leadership," explained Anne Boring, head of the chair. Miren Bengoa, managing director of the CHANEL Foundation, said, "this chair will help raise awareness and train a new generation of entrepreneurs. We must break the glass walls that curb women students’ dynamism and their desire to create and innovate." The existence of barriers to women’s business growth has been observed at Sciences Po, where an entrepreneurship support scheme has been in place since 2008. 50% of the 200 to 300 students who take the introduction to entrepreneurship course each year are women, and their results are just as good as the men’s. However, only 30% of startups in the incubator have at least one woman co-founder and only 20% of co-founders who have been through the incubator are women. The trend is similar outside Sciences Po: only 26% of those with National Student Entrepreneur Status are women (2015-2016 figures) . Sciences Po was therefore anxious to understand the barriers that discourage women students from getting involved in startups. The chair is attached to the Entrepreneurship Centre and forms part of the centre’s development policy. Maxime Marzin, director of the Entrepreneurship Centre, said "what is important to me is to be able to improve the centre’s practices through scientific research in order to prevent biases appearing in the first place, rather than having to correct them after the fact." These barriers to entrepreneurship also affect women who aim to access leadership positions in business. Many companies understand that greater diversity would serve their economic development, but they do not always know how to achieve it. Research shows that many of the diversity programmes for managers that have been in place for years can be ineffective, if not counterproductive (some can even reduce diversity in companies) . Other measures, such as programmes to reduce women’s professional isolation (through mentoring or creating professional networks for women) may work, but more impact assessment is needed to gage the effectiveness of this type of measure, both in the traditional business sector and the startup environment. Thanks to this expertise, the chair will be able to produce research outputs that aim to inform universities, businesses and public authorities. The research will focus on evaluating measures to reduce the impact of gender stereotypes and biases that limit women’s career ambitions. The programme will help advance research on the best approaches for fostering women’s entrepreneurial skills (expertise and soft skills). The first policy brief will focus on the issue of women’s public speaking and measures to help women develop their skills in this area. This research was summarised in a 2016 article in the Harvard Business Review: Why Diversity Programs Fail.